Camposol Fibre – Summer Offers! We’ve updated our prices and offers on Camposol Fibre for the summer! Fibre is the fastest internet on Camposol, and there’s still time to get it installed in your home before the summer hits properly. It’s the perfect time to sign up – for a limited time only, we have scrapped the installation fees on our standard installs for our 100 and 300Mb packages! All Camposol sectors are now benefiting from our lightning-fast Fibre. 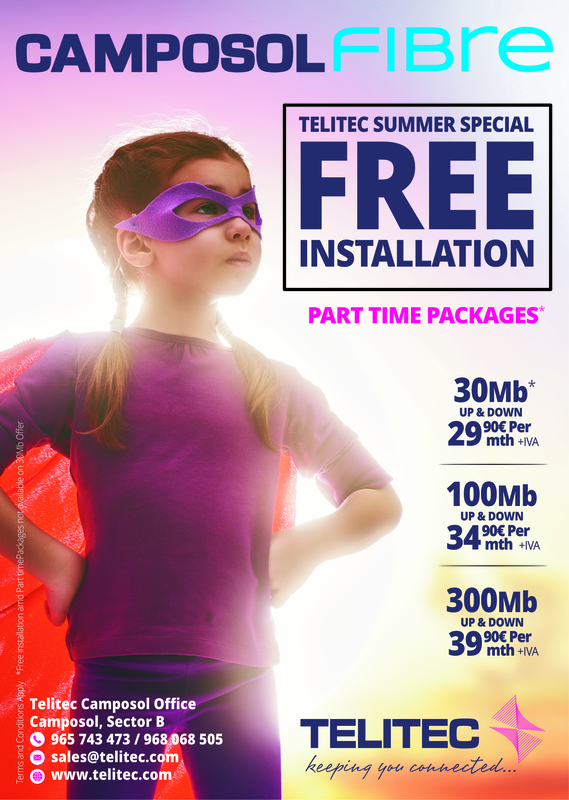 If you’re ready to banish buffering forever and skip the summer-slow-down, simply choose your package and contact us to make the switch. If you’re tied into a contract with another provider, we may still be able to help you upgrade to Fibre. If you show us your contract we will either assist you with cancelling it, OR we may be able to buy you out of your current contract. If your old contract is one reason you’re not upgrading, get in touch and we’ll see what we can do. More good news for part-time Camposol residents – you can now choose to suspend your Fibre packages for up to SIX calendar months per year! This applies to new and existing customers, though we can currently only offer account suspensions on 100 and 300Mb packages. There will be a ‘parking fee’ of 10€ +iva for each month you suspend. Referral Reward- 2 Months FREE Fibre! Our referral rewards just keep getting better – you can now get two months free fibre when you refer a friend or neighbour to Camposol Fibre! If you’re ready to upgrade to Camposol Fibre, or if you have any questions about the service, then please get in touch. Contact us on sales@telitec.net, call us on 965 743 473 or 902 889 070, or use the ‘Tell Me More’ form on this page.